EDNA Contemporary Gallery reconsiders how art maker and art collector connects. We bring the work of our world-class artists into homes and businesses creating a pop-up gallery in a relaxed and enjoyable environment. Not only do these social events showcase thought-provoking contemporary art but also present the opportunity to speak to some of the artists directly. At each event, a portion of all sales will be donated to a charity of the hosts’ choice. We believe this collaboration between artist, community, and collector is beneficial for everyone. EDNA lifts the quiet reverence out of the–often stiff–gallery experience and assists you in the enlightened process of discovering art that speaks to you. Beyond our special events, we work with private collectors, interior designers, and architects to source and commission artwork for public and private spaces. We are now located inside the showroom of Ian Saudé in the design district of San Luis Obipso. As artists rely on gallery representation they often miss seeing their work installed and enjoyed by collectors. This interaction is something Sheryl Daane Chesnut hopes to bring to both the artists and collectors who come to EDNA Contemporary. Sheryl Daane Chesnut graduated from UC Berkeley and UC Santa Barbara with a Bachelor of Fine Art and a minor in Business. She worked for years in marketing and design on California’s Central Coast before returning to a career in fine art. 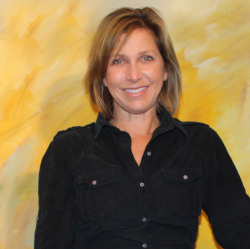 Finding the perfect piece of artwork to enhance your home or office can be difficult or intimidating; Sheryl’s love of art and design and her personal relationship with artists will enhance the process of choosing art for novice and seasoned collectors. Her enthusiasm to facilitate connections between artists and buyers influenced her to further consider the role of art in a community context. EDNA Contemporary is committed to donating a percentage of sales to local organizations as a way of giving back with the belief that fine art can foster systems of interdependence and support.